Advertised STANDARD Power of 147kW yet the vehicle only achieves 105kW at the wheels on a dyno. FACT: - ALL ‘Claimed’ manufacturers engine power specifications are measured at the engines crankshaft. Note the Key Word ‘Claimed’. These ‘Claimed’ manufacturers’ specifications are never checked or questioned by any Government authority or Independent group. The engine power specifications listed here by DPCHIP are ‘converted or calculated’ figures and are to be used as a guide to the power gains you will get from installing a DPCHIP. 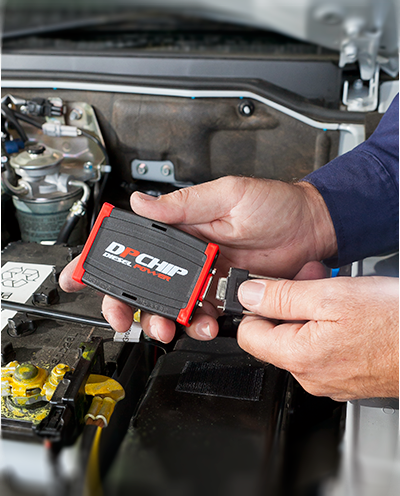 Simply put; to make figures comparative, given that the manufacturer only offers crankshaft power and DPCHIP measure only power at the wheels, DPCHIP have calculated wheel power back to a ‘comparative’ crankshaft power. Be sure you don’t confuse the figures you see here with what you achieve on a dyno. There are many variables in the way a dyno calculates power and there are further variables such as tyre size and transmission type. Larger diameter tyres not only drastically effect fuel economy but also absorb power. Automatic transmissions make dyno results hard to read as there is no ‘solid’ connection to the wheels like found in a manual transmission. It is up to your skilled Dyno Tuning Professional to test the vehicle thoroughly and accurately. Don’t settle for 1 or 2 dyno runs as this will not be a fair and accurate result. Most reputable dyno shops will perform multiple dyno runs so as to achieve a reliable repeatable average of runs. This will allow them to sort through and pick out the runs that can be best used to describe the vehicles dyno results. Remember that to the untrained person a dyno graph can be like reading and trying to understand your health check blood results. Make sure you ask questions and that your dyno operator ‘translates’ your dyno results into information you can understand.